With our rainwater barrel now fully supported with the fabricated rain barrel platform, we will now be able to have a faucet or a spigot installed. The raised platform for the rainwater barrel is 14 inches high, is all-metal and heavily welded. It's adequate to carry the load of a fully filled rain water barrel. Fortunately, the workers who worked on the platform, as well as the garden pergola and garden gate arch, even volunteered to finish the job of installing the rain barrel faucet. They had boring tools like a power drill and sealant, they said. I knew I could make it DIY, but who couldn't refuse free labor? All they asked me was to buy a faucet kit that had locking nuts for mounting in a container. In my search though for a faucet kit with locking nuts and washes, I didn't find any that would be heavy-duty enough to install in a rain water barrel. I've searched in the big hardware store chains and the only kit that I could find was one for dispenser jugs. These dispenser jugs are the kind that you bring in family picnics or parties. They're light-duty and I don't think would survive continued use outdoor in a rain water barrel. What the hardware people suggested instead is to just get (or buy) an ordinary faucet or spigot and then use a pvc female coupling for the size of the faucet, which is usually 3/4 inches in diameter. Be sure to get the female coupling where the threads are inside. I later learned that this is a typical setup in the absence of special locking nuts or washers. Here's a typical basic setup. Unlike the setup above, the faucet I bought is a cheap white pvc one. I don't plan to use the rain barrel everyday of the year. It's only in the wet rainy season when there's rain almost every week that the rain barrel gets water. And if it's rainy season, there's not much sense watering everyday. With a power drill, bore a hole 3/4" in diameter near the bottom of the rain barrel. Remove burrs around the hole. Apply silicone sealant on the surface of the the faucet that will touch the surface of the rain barrel hole (outside the hole and inside). Apply silicone sealant on the surface of the pvc female coupling that will touch the surface of the rain barrel hole. Insert the threaded part of the faucet into the drilled hole. 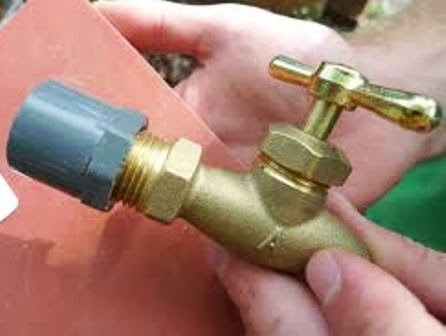 Engage the pvc female coupling with the threaded part of the faucet inside the rain barrel, and tighten. As the coupling is turned and tightened on the inside, the rain barrel's wall is compressed with the faucet on the outside. Allow the silicone sealant to dry. Below is the faucet with the dried sealant added. This is after the workers have completed the installation. The attached faucet worked quite well after filling some water inside the rain barrel, with no leaks whatsoever. I noticed though that the dried silicone sealant had a floppy and rubbery feel to it. This just made me a bit worried on how it will fare under the elements, or if the silicone can be detached should an object hit it at an angle. Just to be sure, I added an extra step. Surround the edges of the silicone with marine epoxy as shown below. Marine epoxy is waterproof and very tough when it has dried and cured. Here, I elevated the barrel on the rain barrel platform and put a big pail underneath the faucet. Notice there's still ample clearance between faucet and the pail's rim. Shown below is actual use of the rain barrel faucet filling up directly a garden watering can.